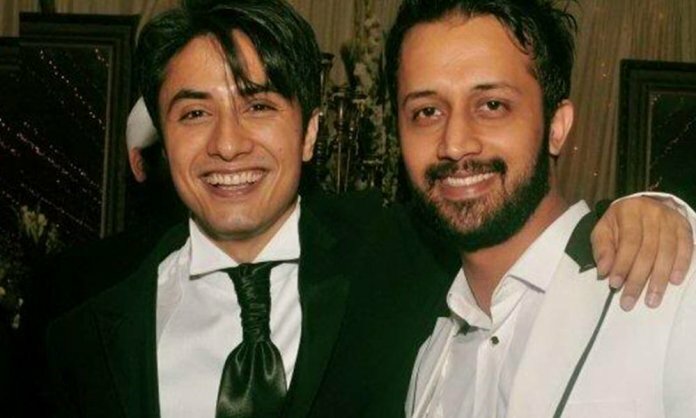 Atif Aslam & Ali Zafar Team Up For A Special Defence Day Song! Atif Aslam and Ali Zafar are among the biggest names in the South Asian music world today. And news has it that the two young lads are set to collaborate for the first time on a song based on friendship and unity and perform live at an event on the upcoming Defence Day on September 6. What happens when two of the best singers in the country come together on the same platform and sing together for a large crowd on an important day in the country’s history? Nothing less than sheer madness and hysteria mixed with a bit of patriotism. The new song has been composed by popular veteran music composer Sahir Ali Bagga. It is also heard that through this song Ali Zafar and Atif Aslam are all set to pay a tribute to the sacrifices of our martyrs of war who laid down their lives for protecting the homeland. We’ve seen the two young heartthrobs hang out and jam together as friends. They have both created a name for themselves across the border also through sheer talent and goodwill. But never have these most talented individuals gone to the studio together to spin some music magic. Now we’ll just have to wait and watch what these two biggies create together for their fans on this special day. But one thing’s for sure: whatever it will be, will be huge among not just their fans but music lovers at large. Previous article10 Bollywood Actresses Who Know How To Rock A Baby Bump With Style! Next articleCornetto PopRock Season 1- Song “Mein” By Ali Azmat Featuring The Life Of A Rockstar Released!